Need a website, stat? With GoDaddy’s GoCentral, you can build one in under an hour. There are two types of business owners: those willing to spend days setting up a website and fine-tuning every last detail, and those who want to build a website as quickly as possible so they can get back to running their business. GoDaddy’s website builder, GoCentral, was made for the second kind. Its intuitive menus make it easy to build a professional, usable website in no time. Sure, your site won’t be super customizable, and you won’t have advanced e-commerce tools, but the building process feels so fast and easy to use that you probably won’t care. You can see how we built a website with GoDaddy in the video below. Then keep reading for a full review: what we loved, what we hated, and what you need to know about GoDaddy’s website builder. We’ve also included a how-to tutorial with helpful tips and screenshots from our own website-building process. GoDaddy claims that you can create a business website in less than one hour with its site builder—and it’s not kidding about that. If you want to create a fully functional website in as little time as possible, you want GoDaddy. Headquartered in Scottsdale, Arizona, GoDaddy offers a variety of website services, like domain registration, web hosting, and even marketing. In this review, we’re looking at its Go Central website builder. Of course, that speed comes with some limitations. GoDaddy’s website builder won’t build you a robust e-commerce site worthy of competing with Amazon. It won’t give you the complete front and backend control that WordPress does (vital for ranking high on Google in competitive industries). But it will get you an attractive, usable website in less time than any of the other eight builders we tested—with almost no technical know-how on your part. For many small businesses (maybe yours? ), that’s all that’s needed. Based on our experience building a website with GoDaddy, as well as our experience with other website builders, we rated GoDaddy on its usability, design, and customization. So how did it stack up? We gave GoDaddy five out of five on usability because, frankly, GoDaddy’s website builder feels easier to use than any other builder we tried. Navigating its menus is a breeze, in part because GoDaddy doesn’t present you with a lengthy and confusing list of options. It has short, clearly labeled menus that make it easy to find what you want and to make changes. And if you don’t like looking through menus, you can always just select elements on the preview window to edit them. That feature might not sound significant, but it meant that we always knew we were editing the right element—something we missed when using builders that made it hard to tell if we had selected body text or a header. GoDaddy’s website builder feels easier to use than any other builder we tried. That ease of use helped us build our website in just 38 minutes. That’s right—in just over half an hour, we created a website that had a home page, an about page, a contact page, a store with several items, and a blog with three posts. And frankly, we were taking our sweet time with things. So if you want a full-fledged website for your business in a fraction of the time it would take on most website builders, then GoDaddy is the way to go. Of course, that fast build time does come with some limitations. While we loved GoDaddy’s usability, its design features didn’t blow us away. So we gave GoDaddy an average design score of three out of five. Other website builders let you customize design on a granular level—you can make each page or section look completely different with different fonts, colors, and layouts. 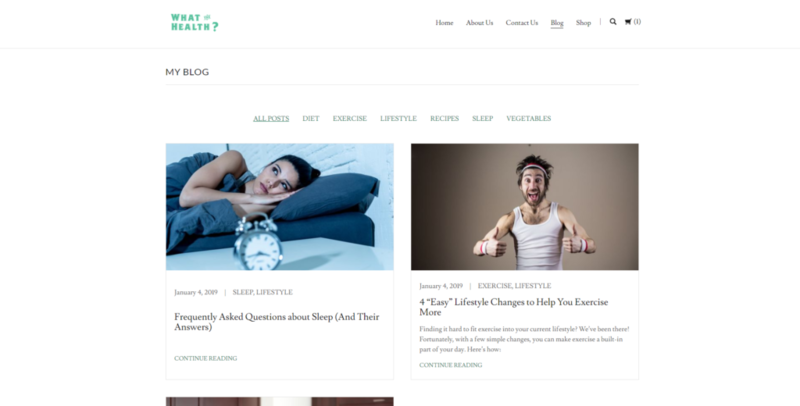 But because GoDaddy has limited customization options (more on that in the next section), site design mostly comes down to how GoDaddy’s themes look. It offers only 19 themes (more on that too). And honestly, they’re not all winners. A couple themes come with default font choices that are almost unreadable, and some layouts definitely look more professional than others. That being said, we genuinely liked most of GoDaddy’s themes. They looked just as professional as free themes from WordPress or other website builders, and they’re all mobile responsive, so they’ll look good on your customers’ phones. With our theme of choice, we created a clean, readable website that users would trust. So as long as you don’t choose an ugly, unreadable theme, you’ll be fine. Plus, GoDaddy has such limited customization options that you really don’t have the freedom to mess up a good template. With some website builders, a poor choice of text color or position can ruin what started out as a nice theme. Not so with GoDaddy. As long as you use reasonably good images, your website will turn out looking good. So GoDaddy has great usability and decent design. Unfortunately, it didn’t score so well in our final category. GoDaddy has far fewer customization options than other website builders, so it earned only two out of five. As we said, GoDaddy has only 19 themes. Other builders have anywhere from dozens to hundreds. And while quantity doesn’t necessarily mean quality, it does mean customizability in this case. Regardless of the theme you choose, GoDaddy lets you choose various content types to go on a page. This makes it easy, for example, to create an about page by choosing content that features images with text underneath—perfect for team photos and names. And since you can choose different combinations of these content chunks, your template won’t lock you in to specific page layouts. And while that sounds good, it’s all downhill from there. GoDaddy’s website builder doesn’t give you control over the little details. So you can choose an overall color scheme, but you can’t change the color, font, or size of specific blocks of text. Likewise, you can’t change other basic features, like how links look when you hover over them or whether your theme’s top menu appears as a list of links or a hamburger icon. 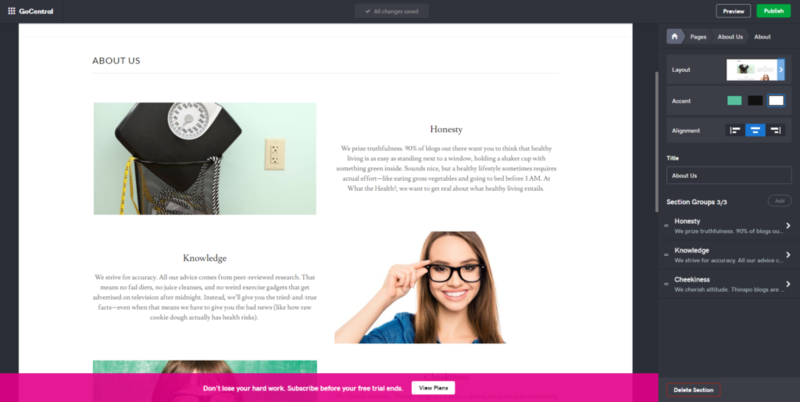 So with just a few themes and limited customization options, GoDaddy feels lacking when compared to other builders where you can change the size, color, and font of each and every word. Plus, GoDaddy doesn’t have plug-ins or apps. Other site builders have plug-ins and apps for anything from customer chat to accounting to calendar scheduling. GoDaddy doesn’t. If a functionality isn’t built in to its website builder, you simply don’t get it. As we pointed out before, GoDaddy has the basics—you can blog, sell, create appointments, etc. You just won’t be able to customize your experience or your website through plug-ins. Keep in mind, though, that GoDaddy’s low customization score shouldn’t necessarily scare you off. If you want a site that looks good with minimal fine-tuning from you, then GoDaddy’s limited customization might feel more like a bonus than a drawback. It definitely helps the building go faster. Turns out you save a lot of time when you stop obsessing over whether your H2s (headers) should be cornflower or azure. Looking for a specific feature? Our table shows you how GoDaddy’s features compare to competitors Wix and Squarespace. GoDaddy has three business plans: Business, Business Plus, and Online Store. You can get a discount on any plan if you opt for annual billing over a month-to-month plan. Annual billing saves you only $24 a year on the Business plan or $36 a year on the Business Plus plan, but it can save you $120 a year on the Online Store plan. And when every penny counts, even small savings matter. All three GoDaddy plans have the basic necessities, like SSL security, mobile-responsive templates, and access to the GoCentral builder. But as you’d expect, you get more features with the higher-cost plans. The Business Plus plan adds support for email marketing campaigns and appointment scheduling, while the Online Store plan gives you everything you need to set up a retail website, including shopping carts and the ability to accept credit cards. In other words, if you only need a basic website with information about your small business and maybe a blog, the Business plan should work just fine. But if you have a service-based business, you might need the extra capabilities of the Business Plus plan. And if you sell items, you’ll almost certainly want to go with the Online Store plan. GoDaddy doesn’t include a free domain, so you will need to add in the cost of a domain name as you calculate. But otherwise, your monthly cost is pretty comprehensive. Good thing you can buy a domain from GoDaddy, right? GoDaddy offers a 31-day free trial for any of its plans. You can try out the GoCentral site builder to see if you like it; if you don’t, you’re only out time—not money. GoDaddy has somewhat limited options when it comes to search engine optimization (SEO). That could make it harder for your website to appear high on search engine results. GoDaddy does allow you to customize page titles, meta descriptions, and headers on most pages. You can include relevant keywords in these to boost your search engine rankings. But that’s pretty much the extent of GoDaddy’s SEO features. In fact, you might not even be able to customize those things on certain pages, like product pages. Other website builders have far more SEO capabilities. Again, though, be honest with yourself: are you the kind of person who both knows how SEO works and will spend lots of time optimizing your business website for search engines? Or do you just want to set up a website and be done? If you have the SEO skills and the time, then GoDaddy probably isn’t for you. But if you just want a website to send your customers to, and you’re not relying on Google searches to get new customers, then GoDaddy’s sparse SEO features may suffice. GoDaddy has an extensive help database for all its products, including GoCentral (the website builder’s proper name). With a little searching, We were able to find answers to pretty much all our questions in that database. And if you can’t find an answer, GoDaddy has an active community full of people who’d love to answer your questions. If you’d rather cut to the chase and speak directly with an agent, GoDaddy offers phone and live chat support. We used the live chat a couple times. The first time, our wait was 10 minutes; the second time, our wait was just one minute. When we called in, we had a four-minute wait. We found GoDaddy’s agents friendly and polite. In one instance, the representative didn’t understand our question at first, but he was happy to work with us until he did. Overall, GoDaddy’s support team seems knowledgeable and helpful, although some customers report much worse experiences. Several people describe similar experiences to ours—a customer support rep who didn’t get what the user was asking—but they say the rep never understood or helped them. So your mileage may vary. But speaking of customer experiences, how do customers feel about GoDaddy’s website builder? Here’s the thing about GoDaddy customer reviews: it’s hard to know if they’re relevant. Remember, GoDaddy offers an entire suite of website-related products, from domain registration to web hosting to site security to marketing to, yes, a website builder. So when people review GoDaddy, they could be talking about any one of those products. For reference, GoDaddy has a 3.8 TrustScore on Trustpilot (out of 10). Important features like customer support and pricing garner both negative and positive reviews. So what’s a prospective client to do? All the big names, like Wix, Squarespace, and BigCommerce have worse ratings. If it makes you feel any better, GoDaddy’s 3.8 rating—low as it seems—is higher than the ratings of most website builders. All the big names, like Wix, Squarespace, and BigCommerce have worse ratings. And since we primarily recommend GoDaddy for simple, low-maintenance business websites, you shouldn’t have to worry much about tech support anyway. Now you’re up to speed on what GoDaddy offers. But how does this website builder actually work? We’re here to demystify the building process and give you the skinny on what this builder does well (and where it could use some improvements). 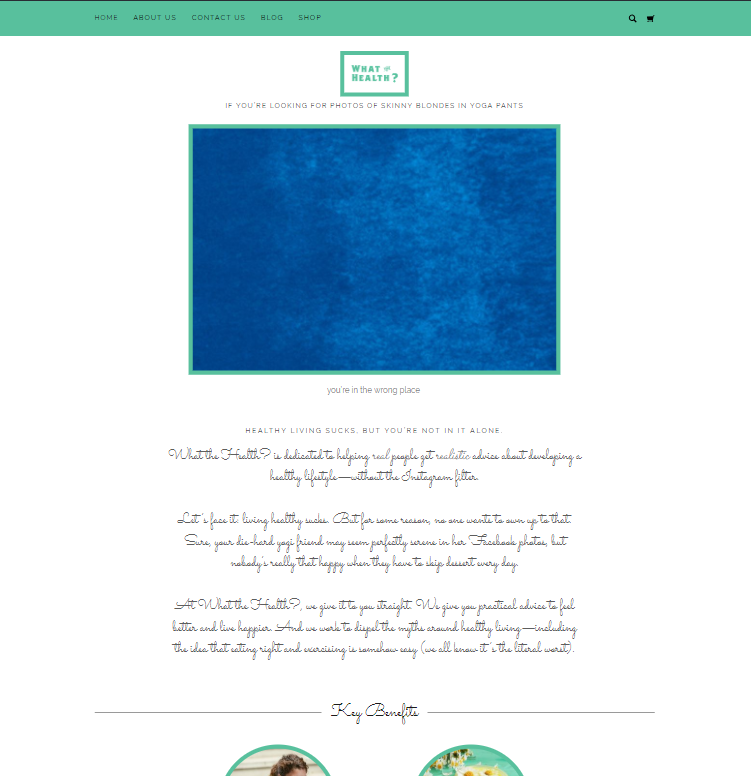 We began building our website by choosing a design theme for our website, along with a color palette and accent font. With just a few themes to choose from, this took only a minute or two. Then we began editing the text and pictures that came with our theme. Fortunately, GoDaddy made it easy to edit any section: we could either select elements from the menu on the right or click on elements in our preview pane to select them. We never had trouble figuring out how to change an element. Simple editing process aside, we like how GoDaddy makes it easy to create a genuinely useful website. After asking us what kind of business we had, the builder prepopulated our website with relevant stock photos and text. In our case, that meant our site had lots of health-related pictures of vegetables and exercising people. While we replaced them over the course of our test, we liked many of the photos GoDaddy chose for us. So if you don’t want to spend time choosing imagery for your site, you might enjoy letting GoDaddy decide for you. It even has an image library of stock photos if you want to change things up without finding images yourself. 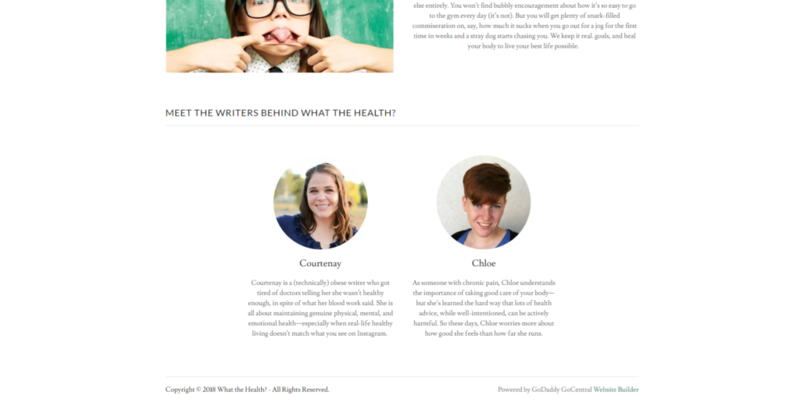 Likewise, GoDaddy included some health-related copy and gave us suggestions for how to create a health-relevant about page. It even gave us some tips on best practices for website copy (like keeping titles short). By following those suggestions, you can create a solid, readable website—without any marketing or writing experience. Just make sure you customize the copy with your business’s details to avoid a cookie-cutter site. You don’t need web design chops either. GoCentral lets you choose various content chunks for each page, so you can create attractive layouts without any dragging, dropping, or coding. To create our blog, we just added a new section and selected a blog element. 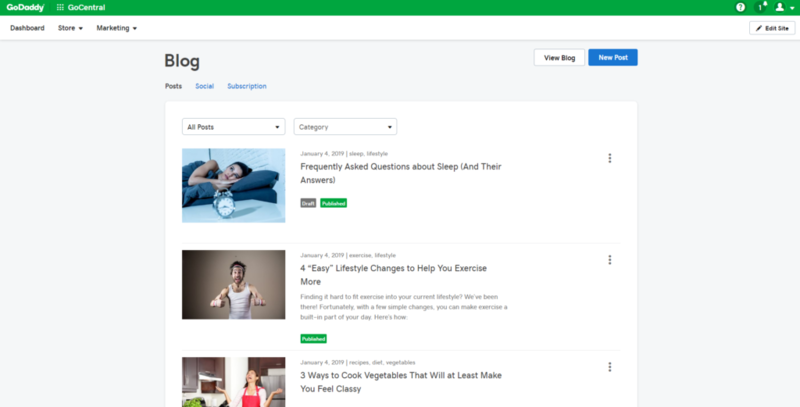 Then GoDaddy built a blog page for us and let us add new posts. Note that blog management takes place in a different tool outside of the website builder (so you can add new posts without breaking out the site builder). Even so, it’s easy to navigate back and forth between your blog editor and your site editor, and the two work seamlessly together. 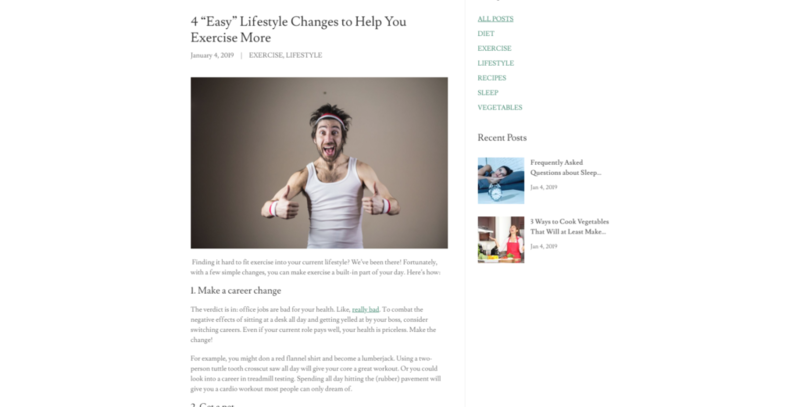 When we added new blog posts, they automatically showed up on our site’s blog page—no editing required. And adding posts was easy. We copied and pasted our blog posts from Google Docs, and GoDaddy kept all our links and formatting. Then we just added a featured image and published the post. GoDaddy even used our featured image to create a thumbnail image for our blog page. We were annoyed when we realized we couldn’t add videos to a blog post. We had to link to a YouTube video rather than embed it, which means users would be leaving our site to watch the video—not ideal for converting visitors to customers. Still, the blog was easy to update and it looked good. So while GoDaddy doesn’t have the most feature-rich blogging platform out there (you’ll want one of our best WordPress hosting services for that), it will definitely work for basic blogging, like a simple mommy blog. The online store felt just as easy to set up as everything else. We just added another content section and chose a store element, and GoDaddy created our store. And with virtually no effort on our part, it looked pretty good. 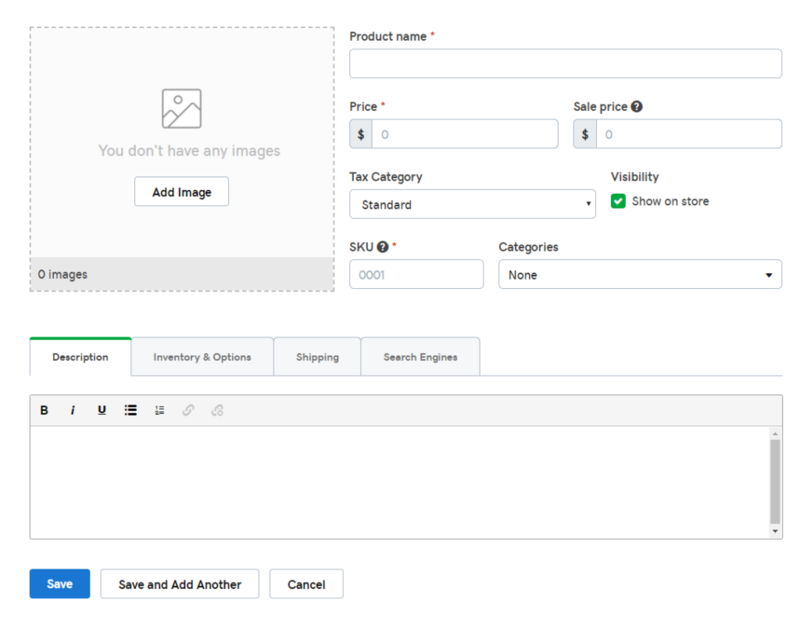 As with the blog, you manage your store through its own tool. But you’ll find similarly simple and easy-to-use menus. Unsurprisingly, the GoDaddy store doesn’t have nearly as many features as a dedicated e-commerce website builder like BigCommerce does. But it has the basics—you can accept payments through Square or Paypal, you can connect to various carriers to get instant shipping quotes, and you can include many details about your products. If you get thousands of orders each month, you’ll probably want a more robust e-commerce platform, like BigCommerce or Shopify. But if you have a smaller operation (like a podcast selling merch or a small retail boutique), GoDaddy has the essentials you need to sell online. Can you choose GoDaddy for hosting but choose a different website builder? Yes, you can choose a different website builder, as long as that website builder is WordPress. GoDaddy offers hosting for WordPress sites—so don’t expect to host with GoDaddy and build with Squarespace or something. Luckily, you can buy a domain from GoDaddy but host your website with other web hosting providers. Will my GoDaddy website look good on a phone or tablet? Yes, all GoDaddy templates are mobile responsive, so they look great on mobile screens. GoCentral even lets you preview what your site will look like on mobile. We performed a super scientific test by holding our phone next to the monitor to see how the mobile preview looked compared to the actual mobile site. The verdict? Our mobile preview looked exactly how the site appeared on our phone. So about those SuperBowl commercials . . .
Do you get any benefits for using multiple GoDaddy products, like domain name registration and website hosting? Not really, no—at least in our experience. GoDaddy didn’t offer us any discounts for bundling domain names with our website plan. Of course, you do get the convenience of having all your website products in the same place—just one username and password to keep track of!—and we like GoDaddy as a domain registrar, so it’s not a bad idea. So should you use GoDaddy? Maybe. GoDaddy is the midsize sedan of website builders: it’s not the most fun, the fanciest, or the most feature-rich, but it’s a reliable way to get from point A to point B. You won’t get the most advanced SEO features, the more robust e-commerce plug-ins, or the prettiest customization capabilities that you’d find with more expensive or complicated site builders—but GoDaddy makes the website building process both easy and fast. High-volume retailers will need something with more e-commerce features, and artisans wanting to express a certain aesthetic will crave more customization options, but GoDaddy can quickly make a perfectly serviceable website for your food truck, household service, small boutique, or freelance portfolio. So if you want a simple but professional website that’s easy to create and maintain—no technical expertise required—then GoDaddy might be just the site builder for you. 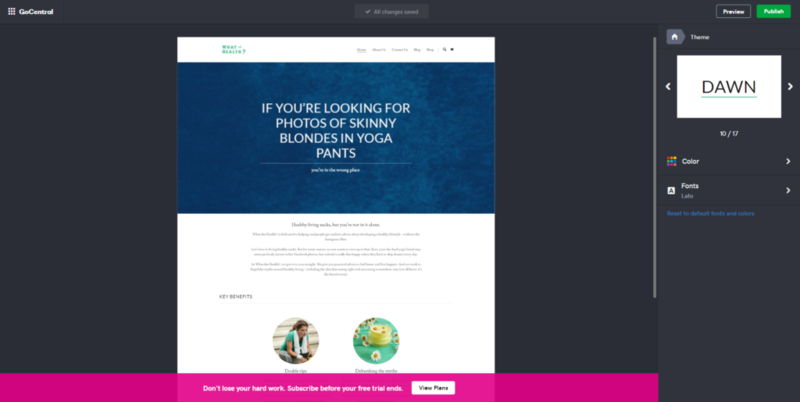 Want a more powerful website builder? 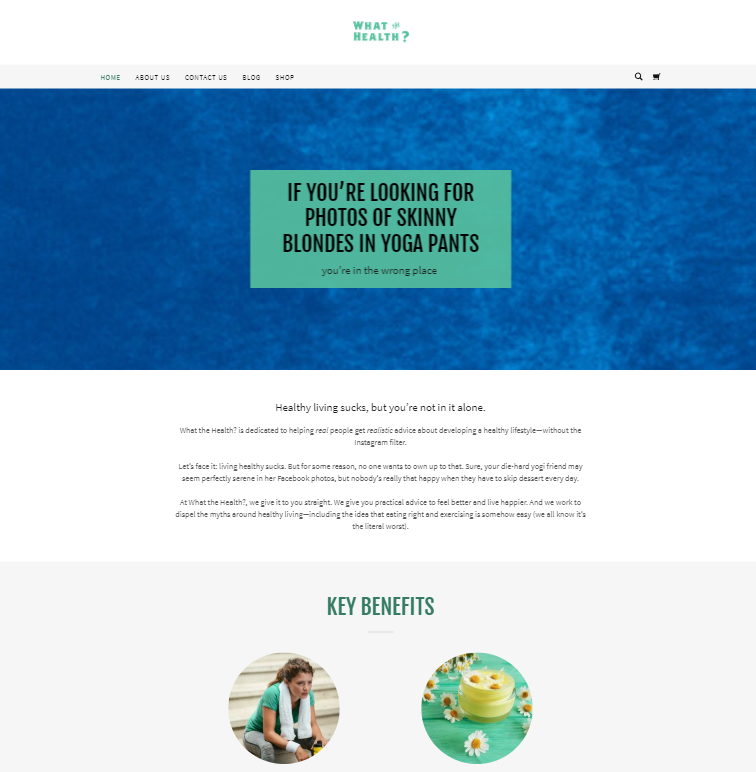 Check out our review of Wix, our top-rated website builder.